The Truth: Zig-zag style heat tape installations do not prevent ice dam formations. 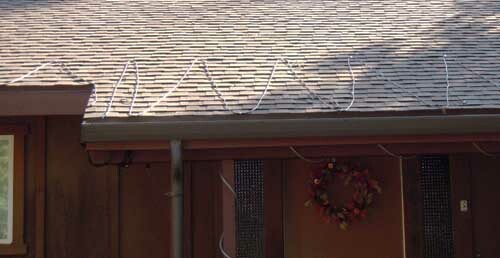 If properly installed, zig-zag cables simply create a small pathway for ice dammed water to pass through the ice dam. Ice dams and icicle formations still occur with heat tape. In fact, more dangerous ice formations can occur with heat tape. Heat tape is often overwhelmed in moderate and heavy snow and their use should be limited to Class 3 Snow Areas. Most people object to the industrial look of exposed cables across their roof. They are attached with shiny silver clips that gleam in the sunshine. They often slip or are pulled out due to ice and snow movement, and that damages the cables. The sad truth is that few zig zag heat tape systems are installed properly. They often do not reach 1′ to 2′ above the wall line. They are not spaced properly. They are not tied to the heater cable in the gutter. This “contractor installed” installation in 2012 demonstrates how easy it is to leave areas unheated and prone to freezing and ice damage. Heat tape cables tend to collect leaves and pine needles. That affects their performance and creates a fire hazard. In suitable snow classifications, Summit Ice Melt Systems’ S1 and S2 heater cables are the best choice. Once up to heat, they modulate their output, making them the safer, more energy efficient choice. It is extremely important that people avoid resistive heater cables. These are often found in the local hardware and big box stores. When they are turned on, they continue at full heat output. Accidentally crossing these wires, or leaving them on at 55* or higher can cause fires. They use a lot electricity and are susceptible to cracking after a couple years’ exposure. They are an expensive option that should be avoided.